The Fairey Rotodyne was a 1950s British compound gyroplane designed and built by Fairey Aviation and intended for commercial and military applications. A development of the earlier Gyrodyne which had established a world helicopter speed record, the Rotodyne featured a tip-jet-powered rotor that burned a mixture of fuel and compressed air bled from two wing-mounted Napier Eland turboprops. The rotor was driven for vertical takeoffs, landings and hovering, as well as low-speed translational flight, and autorotated during cruise flight with all engine power applied to two propellers. Although promising in concept and entirely successful in trials, the Rotodyne program was eventually cancelled when a combination of politics and the lack of commercial orders doomed the project. Fairey developed the Fairey FB-1 Gyrodyne, a unique aircraft in its own right that defined a third type of rotorcraft, including autogyro and helicopter. Having little in common with the later Rotodyne, it was characterised by its inventor, Dr. J.A.J. Bennett, formerly Chief Technical Officer of the pre-Second World War Cierva Autogiro Company as an intermediate aircraft designed to combine the safety and simplicity of the autogyro with hovering performance. Its rotor was driven in all phases of flight with collective pitch being an automatic function of shaft torque, with a side-mounted propeller providing both thrust for forward flight and rotor torque correction. The FB-1 set a world airspeed record in 1948, but a fatal accident due to poor machining of a rotor blade flapping link retaining nut terminated development of the pure gyrodyne. The second FB-1 was modified to investigate a tip-jet driven rotor with propulsion provided by propellers mounted at the tip of each stub wing. This was renamed the Jet Gyrodyne, which despite its name, was a compound autogyro. Fairey put forward their various designs for the proposed BEA Bus, which were revised over the years, and received government funding. However, getting access to engines proved to be difficult, with first Rolls-Royce then Armstrong Siddeley claiming lack of resources. The Ministry of Supply contracted in 1953 for the building of the prototype (serial number XE521). The Rotodyne had a large, riveted steel four-blade rotor and two Napier Eland N.E.L.3 turboprops, one mounted under each of the fixed wings. For takeoff and landing, the rotor was driven by tip-jets, powered by compressors driven through a clutch by the main engines, and the compressed air produced was mixed with fuel and burned. As a torqueless rotor system, no anti-torque correction system was required, though propeller pitch was controlled by the rudder pedals for low-speed yaw control. The propellers provided thrust for translational flight while the rotor autorotated. The cockpit controls included a cyclic and collective pitch lever, as in a conventional helicopter. While the prototype was being built, funding for the program reached a crisis. Cuts in defence spending led the Ministry of Defence to withdraw support, pushing the burden of the costs onto any possible civilian customer. The Government agreed to continued funding only if, among other qualifications, Fairey and Napier (through their parent English Electric) contributed to development costs of the Rotodyne and the Eland engine respectively. Picture - The Fairey Rotodyne prototype circa 1959. Although J.A.J. Bennett had left Fairey to join Hiller Helicopters in California, the prototype, its development assumed by Dr. George S. Hislop, made its first flight on 6 November 1957 piloted by Chief Helicopter Test Pilot Squadron Leader W. Ron Gellatly and Assistant Chief Helicopter Test Pilot Lieutenant Commander John G.P. Morton as Second Pilot. The first successful transition from vertical to horizontal and back to vertical flight was achieved on 10 April 1958. The Rotodyne performed to expectations and set a world speed record in the convertiplane category, at 190.9 mph (307.2 km/h) on 5 January 1959, over a 60 mi (100 km) closed circuit. As well as being fast, the craft had a safety feature: it could hover with one engine shut down with its propeller feathered, and the prototype demonstrated several landings as an autogyro. The prototype was demonstrated several times at the Farnborough and Paris air shows, regularly amazing onlookers. The Rotodyne's tip drive and unloaded rotor made its performance far better when compared to pure helicopters and other forms of "convertiplanes." The aircraft could be flown at 175 kn (324 km/h) and pulled into a steep climbing turn without demonstrating any adverse handling characteristics. Throughout the world, interest was growing in the prospect of direct city-to-city transport. 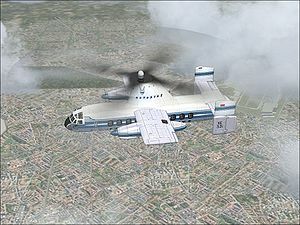 The market for the Rotodyne was that of a medium-haul "flying bus": it would take off vertically from an inner-city heliport, with all lift coming from the tip-jet driven rotor, and then would increase airspeed, eventually with all power from the engines being transferred to the propellors with the rotor autorotating. In this mode, the collective pitch, and hence drag, of the rotor could be reduced, as the wings would be taking as much as half of the craft's weight. The Rotodyne would then cruise at speeds of about 150 kn (280 km/h) to another city (e.g. London to Paris) where the rotor tip-jet system would be restarted for landing vertically in the city centre. When the Rotodyne landed and the rotor stopped moving, its blades drooped downward from the hub. To avoid striking the vertical stabilizers on start-up, the tips of these fins were angled down to the horizontal. They were raised once the rotor had spun up. British European Airways (BEA) announced that it was interested in the purchase of six aircraft, with a possibility of up to 20. The Royal Air Force ordered 12 military transport versions. New York Airways signed a letter of intent for the purchase of five with an option on more albeit with qualifications. The U.S. Army was interested in buying 200 of the Type Y Rotodyne to be manufactured by Fairey's US licensee, Kaman Helicopters in Bloomfield, Connecticut. Government funding was secured again on the proviso that firm orders would be gained from BEA. The civilian orders were dependent on the noise issues being satisfactorily met. In 1959, the British Government, seeking to cut costs, decreed that the number of aircraft firms be lowered and set forth their expectations for mergers in airframe and aero-engine companies. By delaying or withholding access to defence contracts the British firms could be forced into mergers. Fairey Aviation, then the helicopter division of Bristol, and Saunders-Roe were incorporated with Westland. The larger Rotodyne design could be developed to take 57 to 75 passengers which with the Rolls-Royce Tyne turboprops (5,250 shp/3,910 kW) would have a cruising speed of 200 kn (370 km/h). It would be able to carry nearly 8 tons (7 tonnes) of freight and British Army vehicles would fit into its fuselage. Government funding of some �5 million was promised. The expected order from the RAF did not appear - they had no particular interest in the design with the issue of nuclear deterrence to the fore at the time. The Tyne engines were starting to appear underpowered for the larger design. Rolls-Royce were told that they would have to fund the engine development themselves. However, the end came when the interest shown by BEA did not provide an order and a request for an order by the military was turned down. The funding for the Rotodyne was cut in early 1962. The corporate management at Westland decided that further Rotodyne development towards production status was not worth the investment required. After the program was terminated, the Rotodyne, which was, after all, government property, was dismantled and largely destroyed in the same way as the Bristol Brabazon. The one great criticism of the Rotodyne was the noise the tip jets made, however, the jets were only run at full power for a matter of minutes during departure and landing and indeed, the test pilot Ron Gellatly made two flights over central London, and several landings and departures at Battersea Heliport with no complaints being registered. There was also a noise-reduction program in process which had managed to get the noise level down from 113dB to the desired level of 96 dB from 600 ft (180 m) away, less than the noise made by a London Underground train, and at the time of cancellation, silencers were in the pipeline which would have reduced the noise even further. In the end though it was funding and not noise that killed the Rotodyne. It is only relatively recently that interest has been re-established in direct city-to-city transport, with aircraft such as the Bell/Augusta BA609 and the Carter Copter. Groen Brothers Aviation are developing techniques for converting proven aeroplane designs into gyrodynes. Charnov, Dr. Bruce H. From Autogiro to Gyroplane: The Amazing Survival of an Aviation Technology. Westport, Connecticut: Praeger Publishers, 2003. ISBN 978-1567205039. Charnov, Dr. Bruce H. "The Fairey Rotodyne: An Idea Whose Time Has Come - Again?" gyropilot.co.uk. Retrieved: 18 May 2007. Gibbings, David. Fairey Rotodyne. Stroud, Gloucestershire, UK: The History Press, 2009. ISBN 978-0752449166. Green, William and Gerald Pollinger. The Observer's Book of Aircraft, 1958 edition. London: Fredrick Warne & Co. Ltd., 1958. Hislop, Dr. G.S. "The Fairey Rotodyne." A Paper presented to The Helicopter Society of Great Britain and the RAeS, November 1958. Taylor, H.A. Fairey Aircraft since 1915. Annapolis, Maryland: Naval Institute Press, 1974. ISBN 0-87021-208-7. Taylor, John W.R. Jane's Pocket Book of Research and Experimental Aircraft. London: Macdonald and Jane's Publishers Ltd, 1976. ISBN 0356-08409-4. Winchester, Jim, ed. "Fairey Rotodyne." Concept Aircraft (The Aviation Factfile). Rochester, Kent, UK: Grange Books plc, 2005. ISBN 1-84013-809-2.